BOOK REVIEW: ‘Caged in Winter’ by Brighton Walsh—5 Stars! 5 star book review for Caged in Winter by Brighton Walsh, now available in stores. I need to begin this review with a confession: I’m not really a fan on the New Adult genre. But the thing is I really, REALLY want to be. I adore the idea of reading stories about older high schoolers, college students, and adults in their early 20s; however, I’m rarely able to find a novel that can execute such a story in a compelling way. More often than not, NA books I read are an odd combination of YA and intense erotica, which leave me feeling confused and awkward. But every once in awhile, I have the fortune of coming across a book exceeds my highest expectations and reminds me why NA is so popular. Caged in Winter is 1,000% this book. From the first sentence to the very last word, this book has me riveted. The writing is exceptional, the characters are genuine and sympathetic, and the plot is robust and well-paced. I love every moment of Winter and Cade’s story, and gladly give this 5 stars. One night at work, there’s a customer that’s getting pretty handsy, which isn’t unusual. Winter figures that she’ll just keep her cool, play coy, and collect her tip. But her plans are dashed when a superhero-wannabe swoops in, beats up her customer, and Winter is left with 17 cents and no way to buy groceries. Obviously, Winter is upset and she definitely lets her would-be savior know it. But what she doesn’t know is that Cade Maxwell has been intrigued with Winter since he entered the bar that night. And now that he’s on her radar, Cade has no intention of backing out. Winter has been getting by just fine. But there’s something about Cade’s persistence, kindness, and protective nature that makes her want to invite him into her most private places, even when she’d rather be on her own. …darling Cade *swoony sigh* What can I say that can fully encompass how wonderful he is? Cade is tall, stacked, tatted up, and has the motorcycle to boot. But he’s also a chef-in training, a sweet brother to his little sister Tessa, a loving uncle to his niece Hayley, and a potentially attentive and generous boyfriend if Winter would let him! Cade is so good to Winter, and there are times that I get frustrated with her when she pushes him away. But as soon as I start to get upset, I reign it in. While the reader knows, implicitly, that Cade’s intentions are pure, Winter has no reason or prior experience to expect that she can trust him. And even though they enjoy being together, Cade’s desire to protect Winter can trespass on her determination to handle her own affairs. This impasse is definitely an obstacle they face as they decide if can be together longterm. Besides Cade and Winter’s relationship, Caged in Winter also has some pretty great secondary characters. I’m particularly interested in learning more about Jason and Tessa in the next book. And I’m also glad that Winter has at least one friend in Annette. The ending is lovely, yet realistic, and worth the previous heartache and uncertainty. BRAVA Brighton! 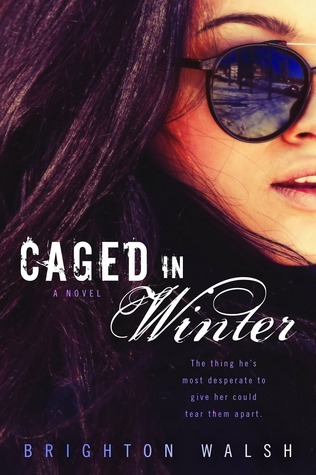 I wholeheartedly recommend Caged in Winter to those who enjoy New Adult and contemporary romance. This book will have you swooning and smiling and rooting for Cade and Winter the whole time. I’m so glad that I won an ARC from Brighton. This is the first novel of hers that I’m reading, but it certainly won’t be the last. Make sure to add Caged in Winter to your Goodreads TBR shelf and grab your copy today!